Now that spring is finally here it's time to freshen up your display with this pleasant theme from ByMe called Vintage Roses and Butterfly Theme. With its vintage and pastel colors, lovely home screen wallpaper, stained draw icon set, and customized colors, hightlights, popups and fonts it's a pretty floral theme to get you through the season. Vintage Roses and Butterfly is compatible with BlackBerry 8520/30, 8900, 9220, 9300/30/60/80, 9630/50/70, 9700/80/88, 9800/10/50/60, and 9900 running OS 4.6.1 and higher. Be sure to check it out in BlackBerry App World for $1.99. Forums member cjh1311 is at it again with another remarkable theme for the BlackBerry Bold 99xx running OS7/7.1. What makes this so amazing is the completely redesigned home screen interface. With a brand new large clock in the corner, a display dock at the bottom, hotkeys to control the docks, and a weather frame in the upper right, it truly is a sight to see. Although, as the default OS7 layout is not being used, you will have the folder issue where icons will not be visible. 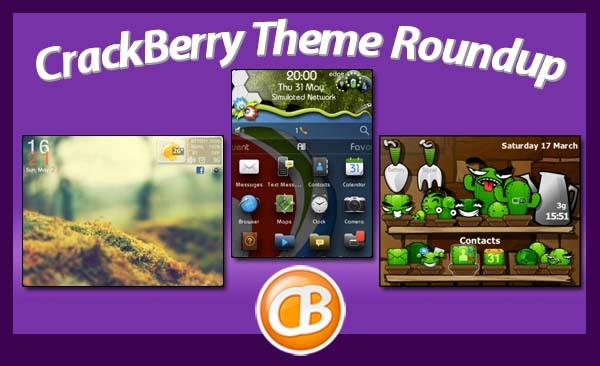 Cjh1311 has been releasing some great themes and this one is no different and you can find it for only $1.99 in BlackBerry App World. Euro Cup Theme by Motek Americas Inc.
Are you a diehard soccer fan? Are you following the Euro 2012 Championships? Get in the spirit with this Euro Cup football inspired theme by Motek Americas. It features an animated hidden dock (OS5/6 only), custom battery and signal meters, free country wallpapers to match your team, custom banner, and a free GOAAAL ringtone in that classic announcer voice. While you follow the action on your BlackBerry app, show off your pride on your display with this cool theme for $1.99. It's available for most BlackBerry devices running OS5 and higher. This week I'm turning up the cuteness factor and including Lovely Dragonfly by chicorie. I'm really liking their style and this is a nice theme to liven up your display. It features a pink and blue color scheme, cute custom icon set (not available for OS7), and bright colorful dragonfly wallpapers. If you're prepared for the sugary overkill then Lovely Dragonfly theme is yours absolutely FREE in BlackBerry App World. It's available for BlackBerry 8520/30, 8900, 9220, 9300/20/30/60/80, 9630/50, 9700/80, 9800/10/50/60, and 9900. CactusGang by TMK is one of those "how did they do that" themes. It truly is an imaginative theme that boggles the mind. Kudos to the developer for the level of customization which includes the cactus icon set (love their facial expressions), spade and trident battery and signal meters, and redesigned interface and wallpapers. You can find it in BlackBerry App World for $1.99. It's compatible with BlackBerry 8350, 8520/30, 8900, 9220, 9300/20/30/60/80, 9500/20/30/50, 9630/50, 9700/80, 9800/10/50/60, and 9900 running OS 4.6.1 and higher.